HASKELL INSTITUTE: 19TH CENTURY STORIES OF SACRIFICE AND SURVIVAL, by Theresa Milk, 168 pp., perfect bound, paper cover. $20.00. ISBN: 0-9761773-8-2. 2007. Also in Kindle format. This original research, a Ph.D. dissertation, presents American Indian/Alaskan Native student stories from early days of Haskell, a federal boarding school, with a balanced look at the ordeals and successes of Native students as they struggled within a military, assimilationist educational environment. Milk, an enrolled Lakota, presents from an Indigenous scholar’s point of view research from letters, newspaper articles, photographs, and documents emphasizes individual stories. This book gives the overall background of Native boarding schools, but additionally adds texture of day-to-day life as experienced by individuals. 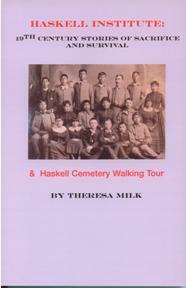 The book includes a Haskell Cemetery walking tour, with information from Haskell records.